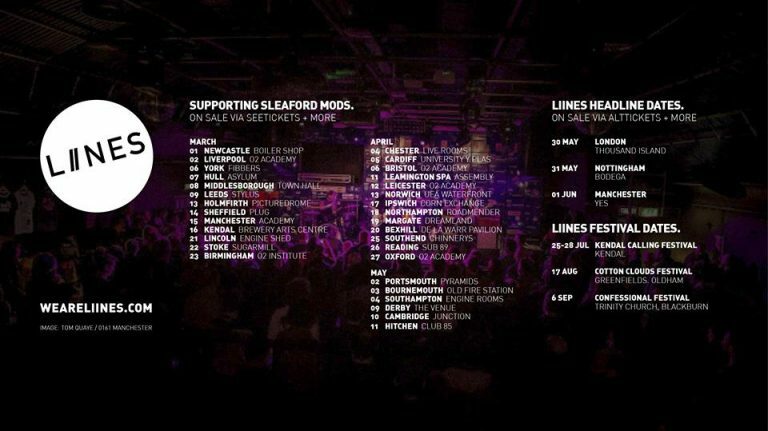 Currently having an amazing time on tour with Sleaford Mods, LIINES have announced the full supports for their headline shows in London (30 May), Nottingham (31 May) and Manchester (1 June). Those announced include label-mates Chorusgirl and Pet Crow as well as a tasty selection of other bands we definitely rate highly. Tickets for the dates are selling fast so now is a good time to get one if you want to catch them. 1 June – YES, Manchester – with Blanketman and Pet Crow (Facebook event / Tickets). After LIINES’ debut album Stop-Start sold out on white vinyl following its release last year we repressed on black vinyl as a tour exclusive. These are selling fast on the Sleaford Mods dates but you should be able to get your hands on one at the headline dates if you don’t yet have one – find all other merch through the online store here. Fancy a Sleaford Mods date? There’s tickets remaining on some dates across the rest of the tour and you can pick them up here. LIINES will also play at Kendal Calling, Cotton Clouds, and Confessional Festival. Make sure you’re signed up to LIINES mailing list through their website for latest news, as well as following them on Twitter, Facebook and Instagram. You can sign up to the Reckless Yes mailing list here where we will share news about our artists. If you’d like to get in touch with us find the demo submission guidelines here.